If you are here looking for a discussion of which left guard hopeful had the third-best day on Saturday, this is not that post. Rather, it is a ranking of things that definitely do not need to be ranked, the ephemera and not-at-all-important parts of a game day that always seem to catch my eye. So if that is the thing you’re looking for I’d be somewhat surprised, but you have found yourself in the right place. It ended up being a pretty decent day for a football game, but Nebraska’s quarterbacks coach was cold. Verduzco wore his gray Nebraska bubble coat, which seems to be his go to for cold days, but complemented it with a pair of red leather gloves. They made a statement. The standard move here would be, if your hands are cold or you anticipate them being cold, to just grab a pair of football gloves from the equipment room. But Verduzco is a man of refined tastes and refined quarterback play. That’s why he gets to wear red leather gloves. 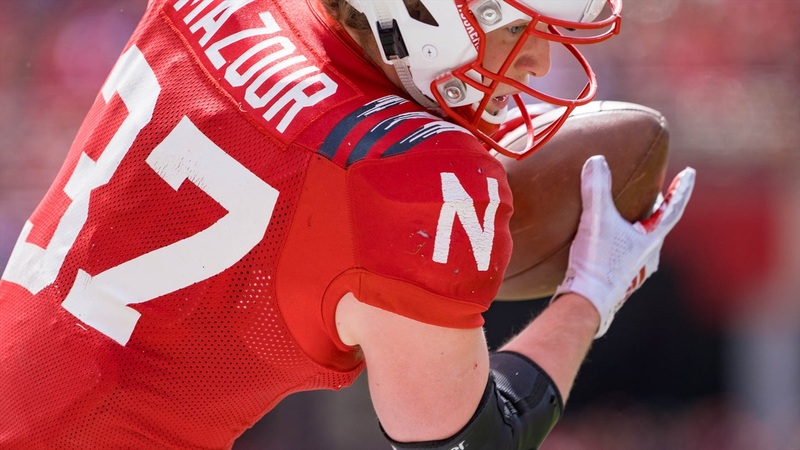 After each Husker game we select a Play of the Game and Jacob Padilla writes about it. It’s not always the “best” play of the game. Sometimes it’s the most important. Some games, there are no Play of the Game candidates, a particularly common occurrence as recently as 2017, and then things get really interesting. But for a spring game, all you’re really looking for is “best,” conventionally defined. Reading it doesn’t quite convey just how it sounded as Martinez recalled one play—a touchdown, yes, but a touchdown in a spring game—and recounted the route combos, who was running them, why one wasn’t there and how the defense played it. And this, I thought at that moment, is why Scott Frost had said moments earlier that Martinez is “clearly one of the best players in the country.” At least part of the reason. 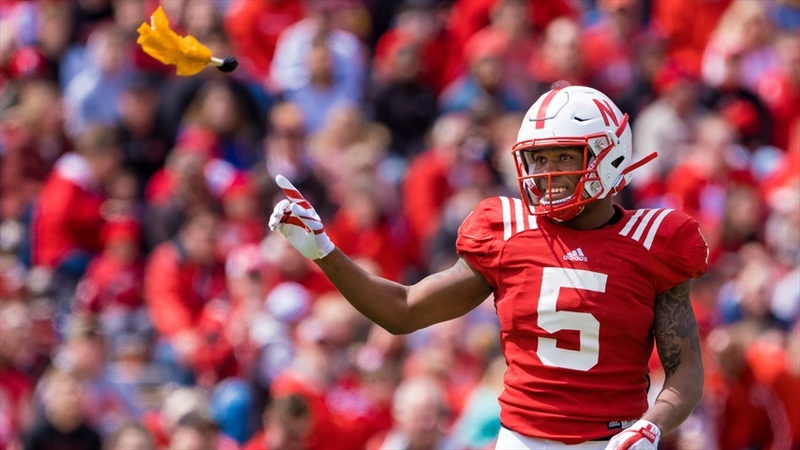 Remember the moment when sophomore defensive back Cam Taylor broke up a pass and an official threw this flag—a high, arcing, look-at-me toss that officials sometimes use—for pass interference? It wouldn’t have been notable if Taylor, using magic, hadn’t stopped the flag in midair, said “nah,” and then sent the flag back on its exact same trajectory into the befuddled ref’s pocket. Again, via magic which arose from the fact that Taylor did not, in fact, commit pass interference. This happened late in the fifth quarter, which is to say it never happened, but you can construct this alternate, more satisfying reality from this photo by staff photographer Eric Francis. Including magic. Can’t forget that. Or Erin Sorensen, who suggested this sorcery, and has voting privileges for these rankings. These are boon times for a burlier Herbie Husker. I noted this last summer after Frost spent most of his first few months on the job favoring a gray hat featuring the older, overall-clad Herbie (and, no, a decade-plus into this, I’ll never stop writing on this topic). Those hats, and appearances of old-school Herbie overall, have only proliferated since them. And as someone who has an unhealthy confirmation bias for signs of an eventual return of this version of Herbie Husker, I definitely took Nebraska’s new pocket schedule as one such sign. People love this logo. Want to make a potential alternate a more palatable idea? Herbie is the key. He will unlock hearts and minds. Here’s how senior running back Wyatt Mazour was attired after tallying 40 total yards for the Red team on Saturday. That looks like real vintage to me, not a fauxback. For a moment I wondered if it was Mazour’s sweatshirt and not something he’d picked up from, say, Goodwill somewhere along the way. Then I realized Mazour was born six months after Nebraska won that 1995 title, so probably not. Still gets the job done, though, just like Mazour.